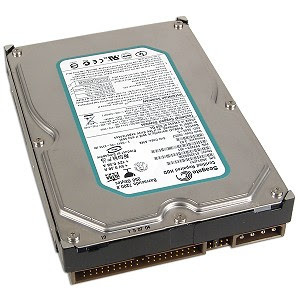 In some cases, such as the recent Seagate Enterprise Storage drive failure, we are able to return the defective drive to Seagate and obtain a new one without question. A while back, we had a client's Seagate 7200.10 500GB drive fail. We RMAd the drive, sent it in to Seagate, and eventually received a replacement drive. In the case where we are sending drives directly to Seagate, there is a bit of a risk as to what we receive back from them. In some cases, we are fortunate and receive a new replacement drive. Whenever this happens, we do not put the returned drive back into production. It is just too risky. That point was proved to us today: This morning when I walked into the shop the data mule system sitting on the bench had a nice greeting: BSOD. After a reset there was nothing but the click of death from the system's Green Label drive. We built the data mule system on a 500GB 7200.10 Seagate factory refurbished drive about 6 months ago. So, if we had supplied the refurbished drive back to the original owner of the original failed drive, we would now be in a situation where warranty work would need to be done and our client would be on the hook for it. Instead, we will be out some time to swap out the Green Label drive with a new one as well as the time needed to obtain another RMA for the now dead drive. We won't restore from a ShadowProtect backup because this situation provides us with a good opportunity to reinstall the OS and only those utilities that we are using frequently. Fortunately, this does not happen too often or we would have a small cache of the Green Label drives here in the shop!